Tony used his latest blog entry at God’s Politics to try to redefine the abortion debate. Obviously, he claims to be a “pro-life Democrat.” And he is willing to go so far as to say that abortions should be reduced. But he doesn’t ever really state why this is a worthy goal. I would like to ask Tony, do you believe there is anything wrong with abortions? Is there something that would, per se, make our civilization better by having a reduced number of abortions? Just curious… Hopefully he answers those questions in the big stack of his books that I recently checked out of the library. If someone wanted to be really cynical they could say that it looks like Tony wants to reduce abortions for the sake of trying to lure traditionally Republican voting Christians away to the Democratic Party. If such a cynic was correct, that would reduce Tony Campolo – self proclaimed prophet – to being a political hack. For Campolo, whose friends clamor for a “third way”, this would certainly impare his integrity as well as theirs. Further, we can fairly ask if Campolo even wants to reduce abortions at all. One of the more dishonest Leftist arguments is that they are really “pro-life” because they are more concerned about the life of the child after it is born. This is not the post to unpack everything wrong with that, but I will offer a rhetorical shot that hopefully wounds the big, dumb beast. If I’m an unborn child (and we all were), I’m willing to take my chances without healthcare, and with poorly performing public schools and a broken federal welfare system, if you promise to keep the skin-eating acid off my flesh and the buzzsaw away from my skull – sound fair? Give me a shot at life (which I would guess you value for yourself) and I will sort out the financial ups and downs from there. Really Tony? Shouldn’t you be telling your Democratic buddies (while you’re busy helping them scribe the party platform in Denver) to also be joining their Republican bretheren in overturning Roe v. Wade, or reducing federal funding for abortions? Or, since, in his words, “hundreds of thousands of young women think that abortion is their only option”, he could use some of his teaching prowess to help them start “thinking” something different. PS – The Republicans did nothing to address abortion? Tony, you dishonest fool! What do John Roberts and Sam Alito (not to mention Justices Scalia and Thomas) mean to the United States Supreme Court? And why did your party attempt to bend space and time to keep them off the Supreme Court? In 1972, five Justices decided they would strip the abortion argument out of the democratic process and leave it solely to the judicial branch of government. I’ll offer a prize (to be determined) to anyone that can find a quote of Tony Campolo’s on the threat of Justice Roberts or Alito overturning Roe v. Wade. Any takers? 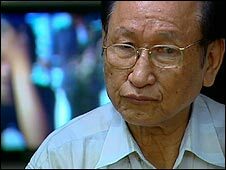 The BBC is reporting that John McCain’s former Vietnamese POW captor is endorsing him for President of the United States. I think he’d make a very capable president. He’s done so much to improve relations between our two countries. Senator McCain, for all of his flaws, must have a remarkable heart and character. While the Vietnamese still deny torturing any POWs (a claim that is hard to believe and McCain personally disputes), any POW experience must be hard to forgive. The BBC also reports that Cindy McCain was in Vietnam for a charity mission last week. Such forgiveness should be modeled and admired.